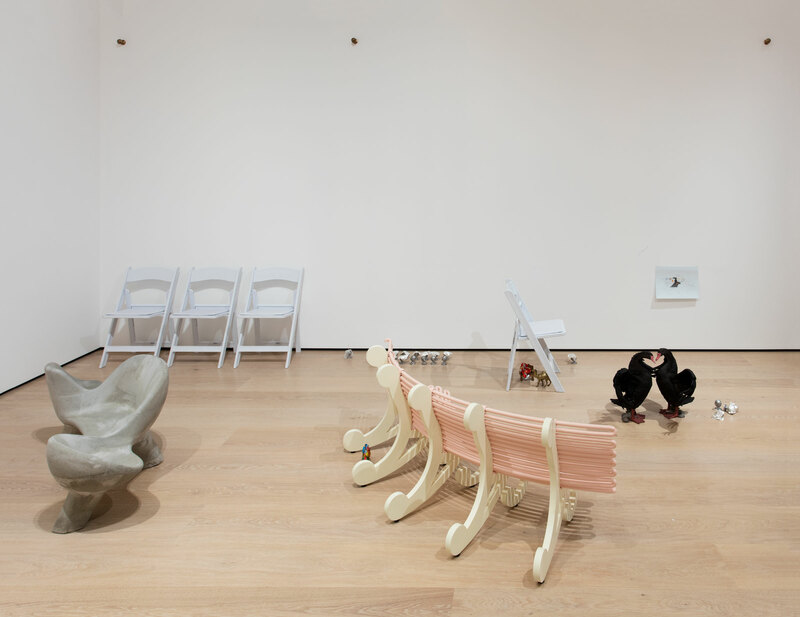 Nancy Lupo, Bench 2015 (left), 2015. Nancy Lupo, Bench 2018 (right), 2018. Intricate networks of materials, objects, and spaces characterize Nancy Lupo’s complex installations. 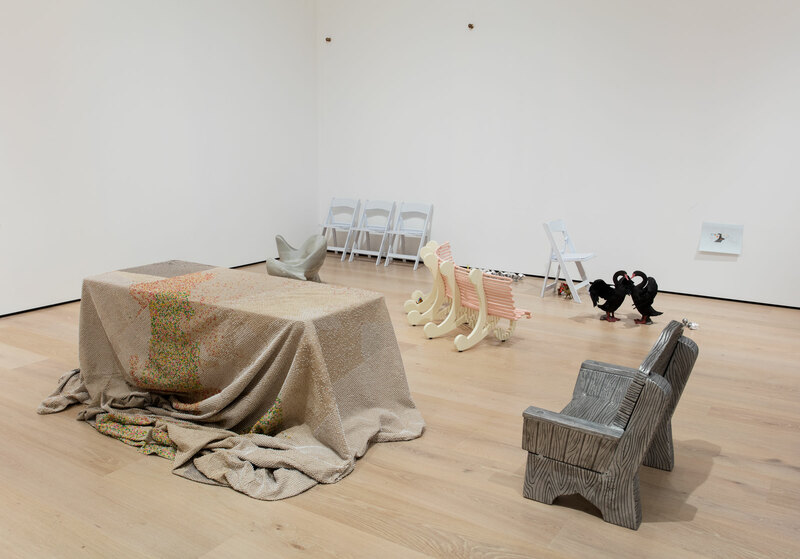 Her multisensorial and affective work often contains organic elements, such as quinoa, foil-covered chocolates, and fruit, and banal items, including dental floss, dog bowls, and folding chairs, in various states of rot or use. Her work addresses the ways in which we move through spaces, as if following latent scripts that punctuate and dictate the rituals and rhythms that shape our daily lives. In many cases, Lupo has installed works outside of the gallery or museum, in city parks, at the beach, on the telephone, and in other semi-private and public spaces. As part of Lupo’s multi-part installation for Made in L.A. 2018, she has assembled four benches that were produced, one per year, between 2015 and 2018 in a range of sizes and from a variety of materials, including cast concrete, fiberglass, and metal. These replicas of existing benches entangle situations of place, time, memory, and imagination. Bench 2016, for example, is based on a monumental and abstract bodybuilder archway at Muscle Beach, in Venice, California, and Bench 2015 is a scaled recreation of a modernist, cast-concrete tête-à-tête bench Lupo noticed in a small park near her home in Los Angeles. 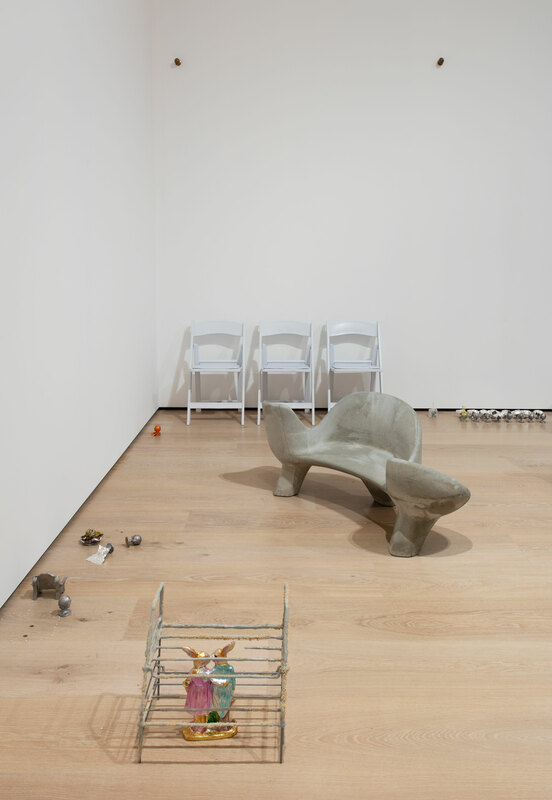 For Made in L.A. 2018, Lupo restages the initial presentation of Bench 2016 in a 1994 Dodge Caravan parked in Hollywood with a large dust cover marking the vehicle’s absence in the gallery. Bench 2018 is sized neither to adult nor child scale; rather it hovers somewhere in between. Scale and mutability are also defining characteristics of a series of new works by Lupo based on Fritz Koenig’s iconic sculpture, The Sphere. Originally commissioned in 1971 for the plaza between the two World Trade Center towers, in the sculpture was badly damaged but survived the 9/11 terrorist attacks. Last year, Lupo remade The Sphere into doorknob-sized bronze objects. For this installation, she included 32 of the bronze and aluminum spheres, which specifically refers to the number of teeth in our mouths and the number of pieces in a chess game. Nancy Lupo (b. 1983, Flagstaff, Arizona) works in Los Angeles. She received her BFA from The Cooper Union, in 2007, and MFA from Yale University, in 2011. She has had solo exhibitions at Antenna Space, Shanghai (2018); Kristina Kite Gallery, Los Angeles (2017); Musée d’art contemporain de Lyon, France (2017); Astrup Fearnley Museet, Oslo (2016); Swiss Institute, New York (2016); 1857, Oslo (2015); WALLSPACE, New York (2015); and LAXART, Los Angeles (2014), among others. Her work has been included in group exhibitions at Museum of Contemporary Art, Los Angeles (2016); Atlanta Contemporary (2016); MoMA PS1, Long Island City, New York (2014); Hammer Museum, Los Angeles (2013); and Night Gallery, Los Angeles (2013), among others. She is a recipient of numerous awards, including the Rema Hort Mann Foundation Artist Grant (2015), Foundation for Contemporary Art Emergency Grant (2013), and Virginia Commonwealth University’s Fountainhead Fellowship (2012).